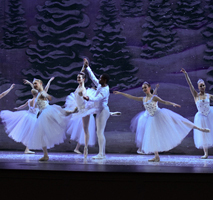 Ballet Theatre Company has been presenting professional, fully staged performances since 1999. Under the artistic direction of Stephanie Dattellas, our 16th annual Nutcracker will feature fifteen New York based professional dancers and a cast of sixty children and advanced student dancers from the Greater Hartford area. The Nutcracker is a holiday tradition that follows the dreams of Clara as her Nutcracker gift comes to life as the prince. She is led through the battle between the toy soldiers and mice, through a wintry snow storm and into the Land of the Sweets to be greeted by the Sugar Plum Fairy and her Cavalier.